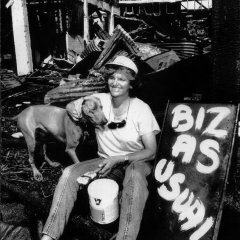 Goodtime Surf and Natural Energy Sports is owned and operated by Gail Austen, (OAM; Telstra Business Woman of the Year 1997) and run by her energetic crew. 2017: After 46 years of business and a constantly evolving retail environment we're excited to hook into 2017 with a renewed passion for service and community. From January this year we will begin a complete revamp of our online facilities, not for the sake of sales, but for the sake of history and trying to find a way to make 46 years of surfing culture and history more readily accessible to our friends and the wider surf and skate community. Our Gabba store will undergo a facelift as a means of getting our history out of the shed and into the view of those that get stoked on the things that drive us!! See you out there. 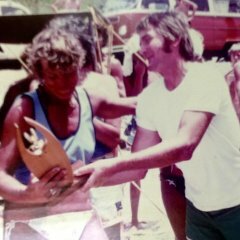 In the 1970's Gail's brother Brian was a top surfboard shaper on the Gold Coast. 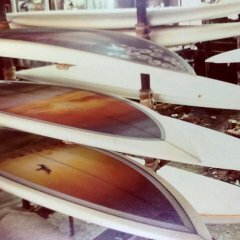 Gail's sister Rae and mum Joan were selling his boards through a shop in Coolangatta. "I was in business in London and my mum wanted me to come home. She said, 'How about just coming home and just helping your brother and sister, giving them a hand with this fledgling little business?' So I came home to give them a hand. I'm still here." The factory was a shambles and the tiny shop opened only occasionally. Surfing was the priority. "I couldn't see myself in this busienss at all. I thought 'I'm too organised for it. How can I go into a business where nobody wants to work?' The whole place was on holidays. There was no money, there were no jobs. To me, they were just a bunch of loafers, but, I tell you what, they loved surfing. So in the end I succembed to the power of surfing." Armed with a "degree in entrepreneurship" earned on the mean streets of London, Gail opened a store where people did go to work and had monaey - Brisbane - and expanded the range to include surf skis, skateboards, canoes, kayaks, kitesurfers and windsurfers. "Anything you could ride a natural energy wave on, because I felt that was the culture." Goodtime outgrew its premises at Breakfast Creek and moved to premises in Woolloongabba, where the business thrived. Then, at about 4am one day in 1984, Gail had a phone call. The shop had been firebombed. "The fire department will tell you that out of every 100 people [in business] that have a fire, one will still be going after 10 years - only one. They told me that the day of the fire, marching through the ashes, and I said to the fireman, 'Were there any women in all the statistics?' And he went, 'I don't know, I can't remember.' I said, 'Thank God for that, mate, because I'm starting right now' "
A news crew wanted to interview her and Gail sensed an opportunity. She faced the camera and said: "Mate, I've only got one message for everybody: tomorrow morning I'll be out the back and I'll be in business ... see you out there." "It was a good message, because people remembered it," Gail adds, laughing. "And, anyway, I didn't have the money to buy the advertising!" Now Gail has devised a unique succession plan at Goodtime. When she retires, the business will pass on to her staff as a form of co-operative. And this is despite the fact that some of her workers have had less than glowing employment histories. "I've trained young people who've come off the streets, people who've robbed me, and these kids have grown. Some of them have got their own businesses. I've got two boys - one's an engineer, one's a doctor - who robbed me to start with. That's how I met them. They still come to the shop with their kids now." "Goodtime is not just a business, it's a way of life, and a good way of life. And I hope that over the next 10 years I can cement that in a structure and develop other youngsters to carry on those programs, so that as I fade away there'll be something left to make it all worthwhile."